Sport Fish Michigan is the ultimate source for Michigan’s Best Fishing Captains and Guides. When nothing less than the best will do, look to Sport Fish Michigan’s network of Michigan’s top professional Captains and Guides when planning your next fishing trip. Take the guesswork out of who to book for your next fishing adventure, and let one of the Sport Fish Michigan Captains or Guides show you a great time on the water. Extensive bios, including location, species, and bodies of water fished are provided for every Sport Fish Michigan guide. Each Captain or guide that appears on the site has been hand-selected and is a full-time fishing professional with years of experience providing customers with excellence in fishing trip services. 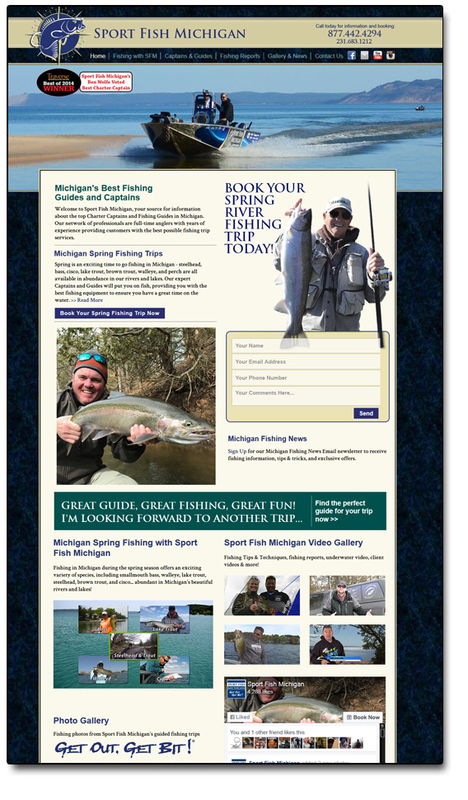 Quickly and easily connect with the guide of your choice through Sport Fish Michigan’s easy-to-use website. Michigan is a paradise for those who love to fish. Beautiful lakes, winding rivers, breathtaking scenery, and prolific fisheries featuring a variety of angler’s favorite freshwater species make Michigan the ultimate location for your next fishing adventure. Whether you prefer to troll Lake Michigan, cast or fly fish, or even ice fish, Sport Fish Michigan has the right Captain or guide for you. We have Captains and guides that specialize in fishing for king salmon, coho salmon, steelhead trout, lake trout, smallmouth bass, largemouth bass, brown trout, rainbow trout, pike, walleyes, yellow perch and more.